Yesterday, Google unveiled another functionality update to Google Ads, one that is expected to provide more insight into conversion trends to improve efficiency in budget allocation. The update focuses around Search Funnels, a feature that has been within the Google Ads system since 2010. However, this feature has often been overlooked due to its hard to find location, buried towards the bottom of the Conversions page under the Tools and Analysis tab. Google’s functionality update addresses this by further integrating Search Funnels into the Campaigns dashboard. 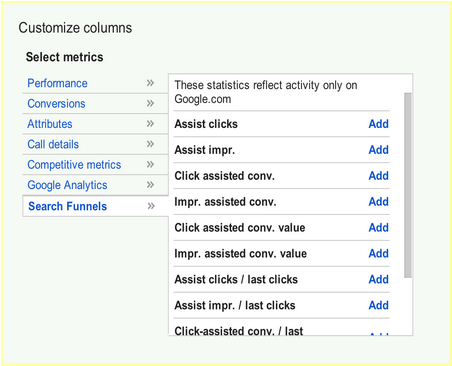 It is now possible to add Search Funnel criteria as additional columns in your Campaigns Dashboard. What is a Search Funnel exactly? Search Funnels provide insight into the user’s path and click-through process prior to making a conversion. Search Funnels can provide insightful data on what ads or keywords were involved in the users search experience prior to making the final conversion. Search Engine Land used an excellent analogy to explain this, comparing the process to scoring a goal in sports. It’s important to not only look at who scored the goal, but who made the assist, and who helped contribute to making the play possible. This is what Search Funnels do. Through them, it becomes possible to see the performance of your ads in different perspectives previously hidden within the system. Seeing the number of conversions an ad assisted with can help paint a different picture on the value of its targeting strategy and design. At first glance, the ads effectiveness may seem like a waste of money, with high impressions, high click through rate, but no conversions resulting from it after several months. However, by measuring assisted conversions through clicks and impressions , it becomes easier to see what value the ad may play in your overall strategy. Although it may not have contributed to a conversion directly, it could quite possibly be responsible for a significant amount of assists, by being clicked or viewed by the user prior to them clicking another ad and making a conversion. By adding Search Funnels as additional columns in your Campaigns Dashboard, information which was once buried away is now up front and integrated into your ad campaign reporting. An ad that has made an impression on several campaign conversions can be considered a contributor to conversions even though no conversion was made directly from the ad. In this case, the ad can be seen as valuable and effective for brand exposure, which contributed to returning traffic resulting in a conversion. Billboards and radio ads act the same way, as they are often considered contributors to brand exposure, and assist in other campaigns conversion opportunities. Unlike Google Ads however, billboards and radio ads cannot be measured in this type of detail. This feature rollout will no doubt contribute to more insightful campaign management strategies. However, it will also result in increased revenue for Google. Why? Because it will demonstrate value on ads which do not directly convert. Ads and targeting strategies that would have traditionally been paused or stopped altogether, will be more likely to continue, now that the ads “big picture” value can be represented. Now that this information can be easily applied to the Campaigns Dashboard as additional columns, the value of an ad will no longer be solely dependant on the amount of conversions it directly contributes towards. Its value will more frequently be represented on how it contributes to other ad conversions, enough incentive to keep the ads running for just a little longer.